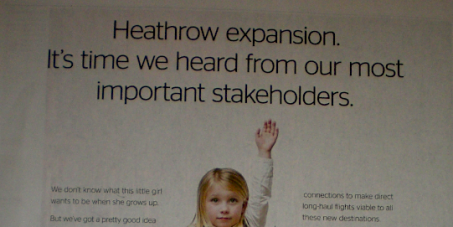 The Heathrow advert suggests that children and future generations will benefit from more runways. In fact it will put their lives at greater risk. More runways equal more air traffic, more emissions, more climate change, more extreme weather events – and more deaths by flooding, droughts, crop failures leading to starvation, landslides, forest fires, etc., etc. Ask the Advertising Standards Authority to ban this completely misleading advert.